We look at the unemployment statistics in the newspaper and see a blended picture of all Americans. Currently, we are told, 4.6% of Americans who are looking for a job are unable to find one. But what is the figure for adult men and women over age 20? Or for people with a high school diploma vs. those who are college-educated? The Labor Department Report that the newspapers are reporting on actually breaks down these figures in some detail, as you can see in the accompanying chart. Notice that much of the actual joblessness is found in the teenage population, age 16-19 years, where unemployment runs at 15.2% overall. Also note that white Americans have a rate below the national average (4.2%), while African-Americans are unemployed at higher rates (8.1%). 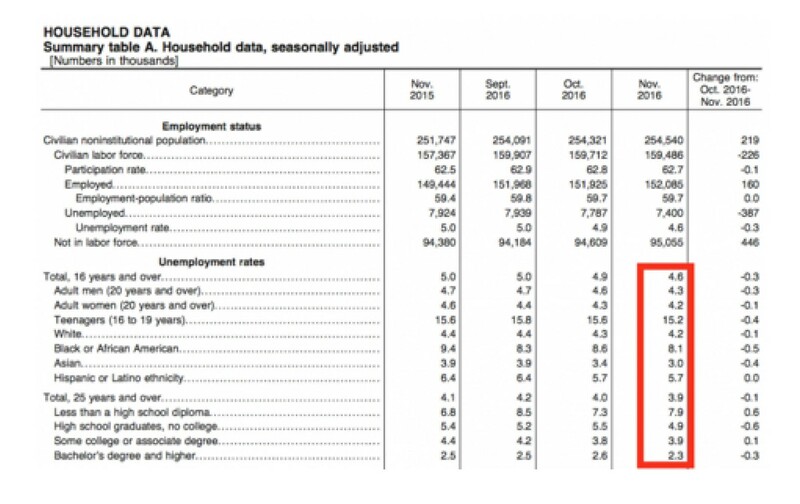 Look lower on the chart and you see that people 25 years and older, overall, have an unemployment rate of just 3.9%—a figure you probably won’t see anywhere in the headlines. Break that down by education, and you see the value of a diploma or degree, as the rate is three times higher for people who never graduated from high school (7.9%) than people who graduated from college (2.3%).